What is your favorite weekend getaway just an hour or two outside Manila? For over 10 years now, my husband and I prefer to go to this natural hot spring resort in Laguna. 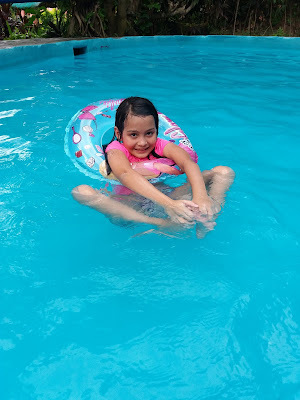 It it is called La Roca de Trinidad and it where we always go for a swim and barbecue if everyone in the family is free, weather is favorable and traffic situation is tolerable. Honestly, we do not get tired of the place because of the memories we have created and shared therein. Plus, it is always clean, not crowded, and the staff are friendly. We used to visit as a couple, now we go as a family so it's more enjoying. We went there again on a Saturday last month and discovered some improvement like they started adding a lanai to their picnic shed and also increased the temperature of the swimming pool. 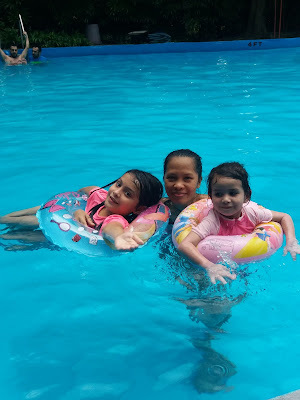 Here I am with my daughters in their floaters. 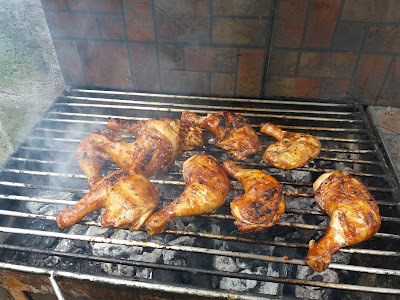 We grilled some chicken, fish and pork liempo (last two not in picture). This little miss right here was first hesitant to jump in the water. Later on she was unstoppable as well as her younger sister. Lol. 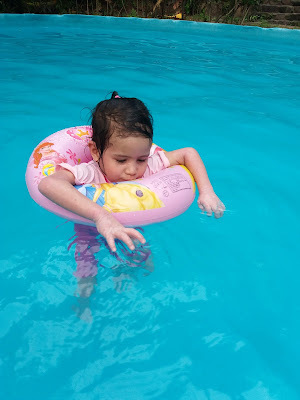 Suna already fits a small floater. No more baby floater for her. 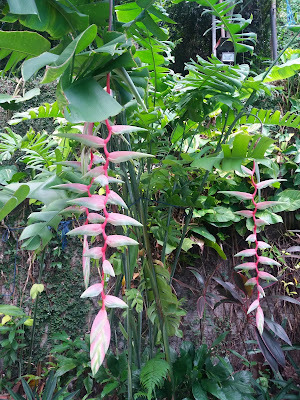 This place is surrounded with trees, plants and flowers so we could really relax during visits. The entrance fee is minimal and there are choices of picnic table, picnic shed, big hut, pavilion, air-conditioned room, etc. for daytime rent or overnight. 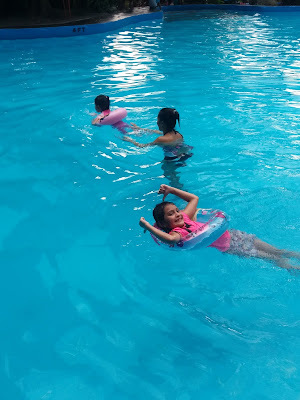 This place is located just a little ahead of 88 Hot Spring Resort in Los Banos, Laguna. Disclaimer: this is not a sponsored post. If you need more info. on La Roca de Trinidad Resort, you can visit http://larocaresort.com/. Being a June baby and having knowledge that it is my actual birthstone, it is almost natural for me to like pearl as my jewelry. I remember admiring an old churchmate with her pearl bracelet, a gift from her fellow missionary from the Pacific. That time, I didn't know the difference between a freshwater pearl and a south sea pearl yet, so I was thinking my churchmate was one very lucky lady to have worn such beauty in her arm. As a young office girl earning a very humble income, obviously I didn't have enough money to buy real pearls. I thought, I can work hard and buy me some pearls someday. 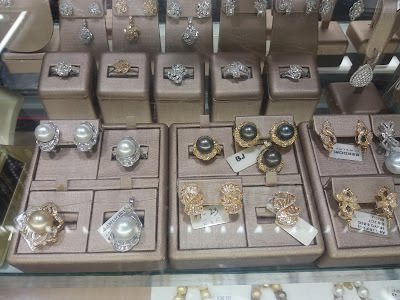 Fastforward to present, I now have a decent set of south sea pearl jewelry plus better knowledge on pearls and pearl shopping. 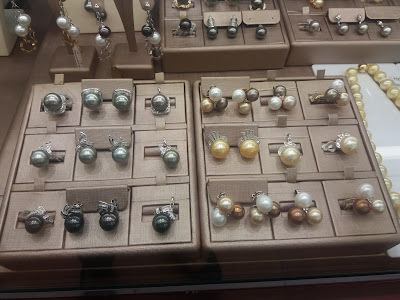 Just the other day, I made it to a legitimate pearl store in Greenhills by the name of Berdori and bought a set of quality freshwater pearls as gift to a friend and a new pair of golden south sea pearl studs for me. I know I was not supposed to buy again, but I was soooo tempted. Luckily, hubby approved my wish and so I'm a one happy wifey. Next on my wish list is one of these south sea pearl necklaces. They all look so grand most esp. the golden one. Or maybe another set but with diamonds instead of plain gold? Oh my, I think I'll have to starve my family to get one. 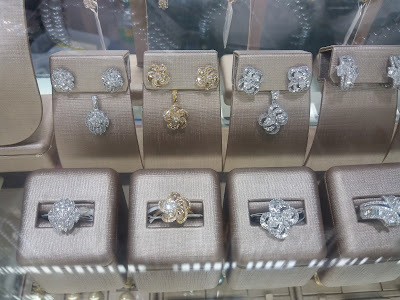 Berdori is now my current favorite jewelry store in the Philippines. Thanks to Miss Edwina, the very kind saleslady of Berdori in Greenhills. I know I will be back to Berdori to buy another set of pearls. 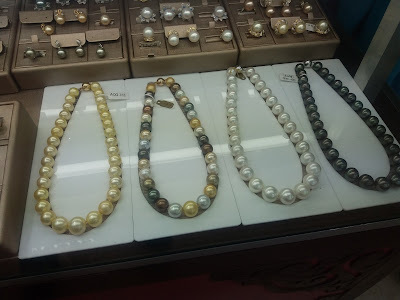 Update August 5, 2016 12:30 PM: I went back to Berdori to buy another set of pearls again today. Haha.